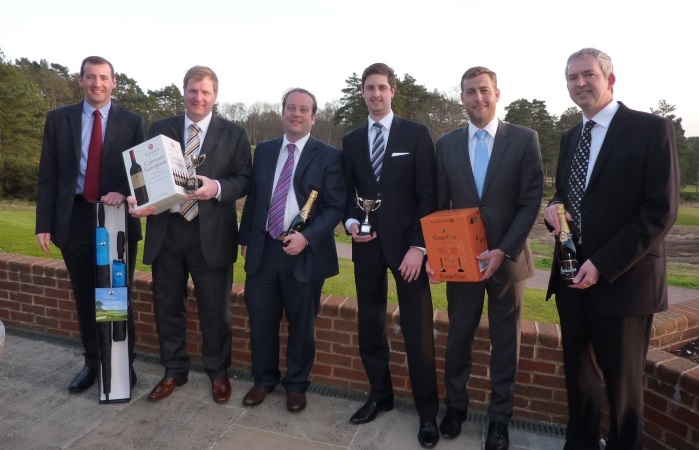 It was sunshine all the way at The Berkshire April fixture in complete contrast to the first golf day of the year at West Hill when it rained non-stop. The weather couldn’t have been more different with cloudless skies, dry fairways and perfect golfing conditions for the 36 players. Just to add to the enjoyment of the day the morning competition was played on the Blue course which is just as good and high up the rankings of the country’s best courses as the alternative Red course that hosts the Society’s Christmas Scramble. It is hard to fault anything about The Berkshire and for those who struggled with their form there was always the wonderful warm welcome from everyone at the Club and one of the best lunches you will ever have, including a mouth watering array of home made calorific puddings! Enjoying both the golf and the food was the morning winner Peter Murphy from Harmsworth Printing who really showed why he was an Inter-Company winner last year when he amassed a brilliant 41 pts to win the Rothermere Cup, four points clear of his nearest rivals, Jobsite’s Mike Newall and Mail Newspaper’s Nick Stevens with Mike just taking second place on count back. Close up in fourth with 36 points was Euromoney’s Stephen Byrne with Broadbean’s Dan Martin in fifth with 35 points. 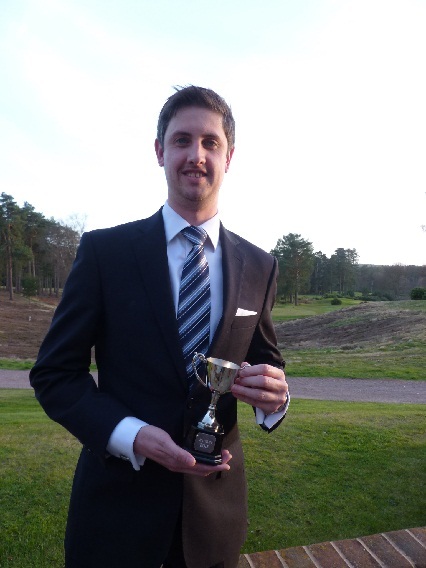 As always players want to win but they also fear the dreaded handicap cut with the Inter Company competition looming and Peter was cut three shots to eight handicap for scoring over 40 points as per the Society’s handicap rules, with Mike cut just one shot to 17 handicap. The afternoon Greensomes competition around the Red Course was won by Metro’s Craig Fawcett, ably assisted by A&N’s June McFarlane’s guest Graeme Elliott. Craig won the Northcliffe Cup with Graeme being presented with a visitor’s prize for their 40pts, just beating on count back Nick Stevens and Nigel d’Cruze from Mail newspapers. In third was retired member Barry Waterton and guest James Selby with Jobsite’s Phil Lightbody and morning runner up Mike Newall playing off his new handicap in fourth place. Nearest the Pin in the morning on the starting Par 3 hole of the Blue course caused major problems for most players with only two names on the marker at the end of the round and winner of the champagne from Harmsworth Printing was Keith Burkin. The afternoon champagne for Nearest the Pin on the 18th hole was won by Mike Wall from Evenbase. There were three people who scored 2’s in the morning competition and they were all on the Par Three fourth Hole. Clive Heard from dmg media accounts, Rob Thomas from Jobsite and John Bowman from the colour studio collected £20 each and there were two people who decided that Peter Murphy was the man in form in the fund raising Back the Winner competition. Both Keith Burkin and Barry Theobald from the Colour studio collected £60 each for selecting Peter with £60 going into the Society’s funds. There was £53 profit from the Ball Sweep and £12 from the 2’s competition. 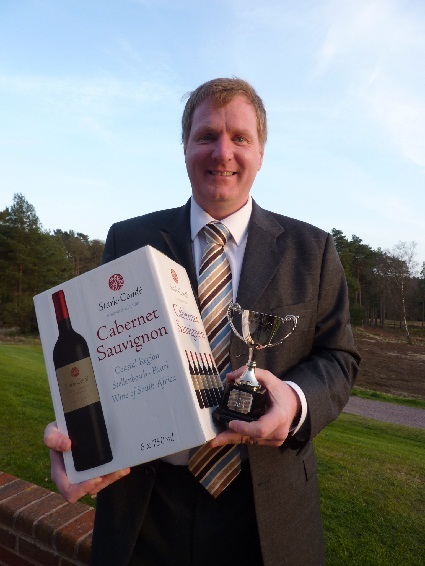 Secretary Garth Burden thanked everyone for their fund raising during the previous year which had meant the £69 cost of the day was one of the best golfing bargains of the year. He said there would be six teams taking part in this year’s Inter Company competition, the Chairman’s team, Daily Mail, Mail on Sunday, Metro, dmg media and Evenbase with Euromoney delaying their first appearance until next year. Captain of the Day, Mike Wall, who presented the winning trophies and prizes, thanked The Berkshire for making everyone so welcome and said what a great day it had been. He was glad that the Society had already booked the Club for next year as it was such a golfing treat.